Okay, so I know popcorn chicken is named that way not because it's made with popcorn but because it's in bite-sized little pieces like popcorn! . 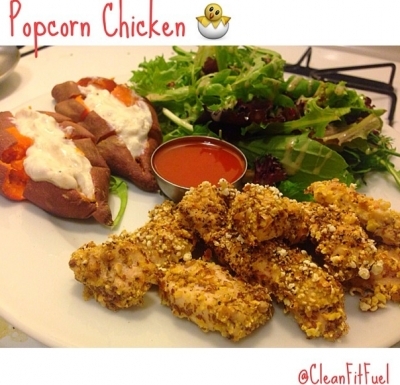 Buuuuuut these little popcorn chicken are ACTUALLY made with popcorn! I used Trader Joe's no guilt air popped popcorn. So good. . This meal is for 2 people. Or for your dinner and lunch the next day! 1. In a blender or food processor, pulse 4 cups air popped popcorn, 1 tbsp garlic powder, 1 tbsp black pepper, 1 tsp sea salt (or whatever seasonings you prefer!). 2. In a bowl, whisk 1 whole egg + 3 egg whites (or if you don't like eggs like my crazy roomate, let 2 tbsp flaxseed meal and 2 tbsp of water sit for a few minutes to use as the "egg" mix) and a dash of hot sauce. 3. Cut up 3 large chicken breast into tiny pieces, dip them in the egg mixture and then roll around in the popcorn mix. 4. Spray a baking sheet with olive oil and cook your popcorn chicken at 350 degrees Fahrenheit for 15 minutes and then broil for 10! 5. Find some good dipping sauces! I obviously went with Frank'sðŸ”¥. I know, I'm sooo predictable! .